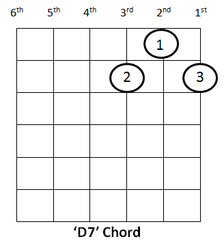 There are many reasons why the 'G' chord is often learnt first. As soon as you try to put your fingers in those positions, you might start to feel a little awkward. You must use the correct fingers - i.e. your 3rd finger on the first string. Your thumb, on the back of the guitar, should point towards the top end of the 6th string. 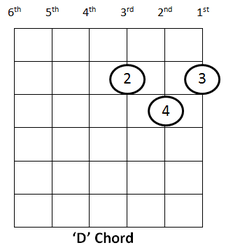 Here is a photo of someone playing the 'G' chord. 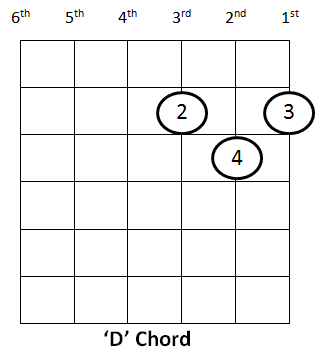 Again, if this is awkward at first, you can place your first and second finger and only strum the first four strings, but it is good to play the full chord as soon as you can.